The Blackie Sherrod Award honors North Texans whose inspired storytelling and passion have heralded worldwide the region's deep love affair with sports. It is presented by the Dallas Sports Commission and is awarded in conjunction with major championships hosted by the North Texas region. The award was most recently bestowed upon Kristi Scales and Charean Williams at the 2017 NCAA Women's Final Four. 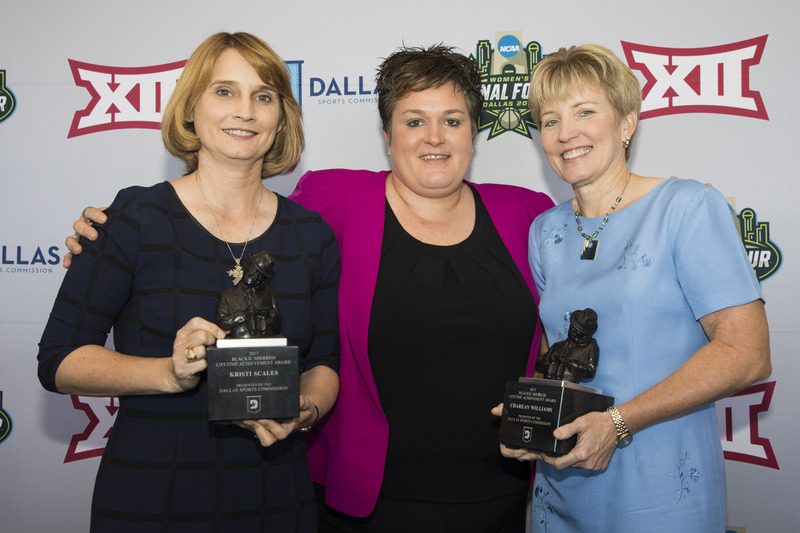 Scales, who serves as sideline reporter on Dallas Cowboys radio broadcasts, and Williams, the Fort Worth Star-Telegram's NFL columnist, were honored as part of the NCAA's Beyond the Baseline: Women in Leadership luncheon on March 30, at the Tower Club in Downtown Dallas. "The Blackie Sherrod Award was created when North Texas played host to Super Bowl XLV," said Monica Paul, Executive Director of the Dallas Sports Commission. "It was named after our greatest newspaper journalist, former Fort Worth Press, Dallas Times Herald and The Dallas Morning News columnist Blackie Sherrod. The award was created to honor those members of the local media who have fostered our deep love of athletic competition and established North Texas as one of the premiere sporting destinations in the world. It's fitting that as we host the largest annual female sports championship in the country, we honor two women who broke down barriers and proved there is no glass ceiling for talent and excellence." Scales has roamed the Cowboys sidelines for 20 years as part of the team's radio broadcast. In 2002, she became the first female to fill the role of 'analyst' in the booth for an NFL radio broadcast. Williams joined the Fort Worth Star-Telegram staff in 1999, after spending six years with the Orlando Sentinel. She is the first woman to serve as selector for the Pro Football Hall of Fame and the first female to be named president of The Pro Football Writers of America. "Blackie was one of a true treasure," said Kevin Sherrington, who sits on the award's selection committee. "We were delighted when he allowed us to name this award after him. I know our entire selection committee takes its duty with a profound sense of pride and responsibility. It's important to each of us to appropriately honor the legacy of sports media in North Texas. I don't know how we could have made better, more appropriate selections, than Charean Williams and Kristi Scales. They are professionals, hugely talented, trailblazers and as if that weren't enough, two of the finest people you will ever meet." Sherrod passed away in April 2016 at the age of 96. He began his newspaper career as the unpaid Belton correspondent for the nearby Temple Telegram before going off to serve as a Navy torpedo plane tail-gunner in the South Pacific in World War II. He moved to Fort Worth in 1946 and became sports editor of the Fort Worth Press in the early 1950s. Sherrod took his popular column in 1958 to the Dallas Times-Herald, where he also helped cover the 1960 Democratic National Convention, the 1963 assassination of President John F. Kennedy and the 1969 Apollo 11 moon landing, for which he won a Texas Headliners Club award for science writing. The Dallas Morning News hired Sherrod in 1985, and he continued his column until retiring in 2003. His flagship fixture was his weekly "Scattershooting" column of brief nuggets of news, commentary and witticisms that ran in Sunday editions. The Blackie Sherrod Award selection committee is comprised of award co-founders Brad Sham and Tony Fay, Larry Kelly (Dallas Sports Commission), Sherrington (The Dallas Morning News) and Newy Scruggs (sports director, KXAS-TV).